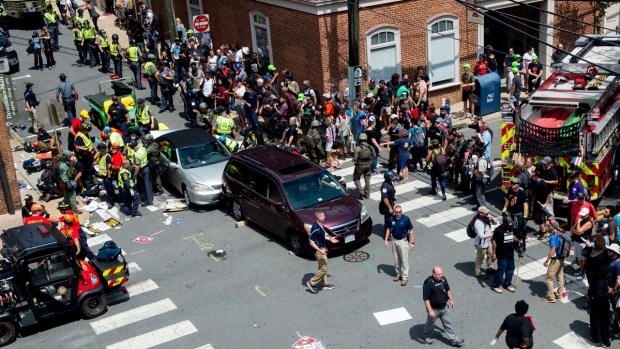 Authorities have charged a 20-year-old Ohio man for the deadly car ramming incident in Charlottesville, Virginia on Saturday, as the Department of Justice announced a civil rights investigation into the circumstances surrounding the crash. James Alex Fields Jr. allegedly plowed into a crowd of people peacefully protesting a white nationalist rally Saturday in a Virginia college town, killing Heather Heyer, 32, hurting dozens more and ratcheting up tension in an increasingly violent confrontation. Fields has been charged with one count of second degree murder, three counts of malicious wounding, and one count of failing to stop, according to officials. 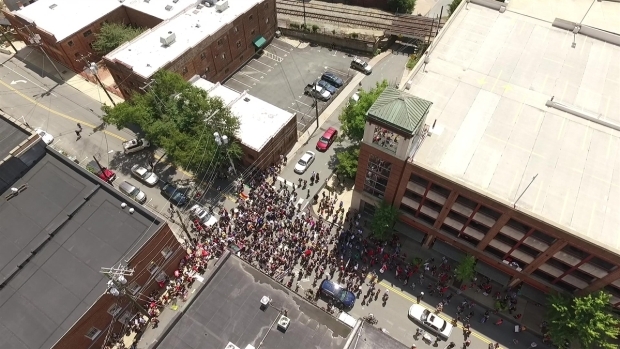 Drone video shows the moment James Alex Fields Jr. allegedly plowed into a crowd of people peacefully protesting a white nationalist rally Saturday in Charlottesville, Virginia. Attorney General Jeff Sessions, meanwhile, said late Saturday that federal authorities were launching a civil rights investigation in response to the deadly ramming. “The violence and deaths in Charlottesville strike at the heart of American law and justice," Sessions wrote in a statement. "When such actions arise from racial bigotry and hatred, they betray our core values and cannot be tolerated." 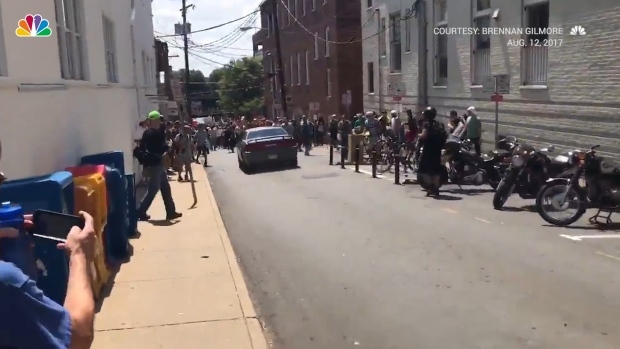 A 20-year-old man from Ohio has been charged for ramming into a crowd of counter-protesters after a white supremacist rally in Charlottesville. Two troopers also died after their helicopter crashed a few miles from the rally. They were flying above the violence to help officers on the ground. News4's Derrick Ward and Chris Lawrence have team coverage. Virginia police arrested three others in relation to the unrest at the rally. Troy Dunigan, 21, of Chattanooga, Tennessee, was arrested and charged with disorderly conduct; Jacob L. Smith, 21, of Louisa, Virginia, was arrested and charged with misdemeanor assault and battery; and James M. O’Brien, 44, of Gainesville, Florida, was arrested and charged with carrying a concealed handgun. Matt Korbon, a 22-year-old University of Virginia student, said counter-protesters were marching when "suddenly there was just this tire screeching sound." A silver sedan smashed into another car, then backed up, plowing through "a sea of people." The incident happened about two hours after violent clashes broke out between the opposing groups. Hundreds of people chanted, threw punches, hurled water bottles and unleashed chemical sprays. Over a dozen people were injured and one arrested in connection to the earlier violence, officials said. Five patients were in critical condition Saturday evening, four in serious condition, six in fair condition and four in good condition, according to the University of Virginia Health System. Gov. Terry McAuliffe declared a state of emergency. Adding to the chaos on Saturday, a helicopter that was assisting public safety resources with the rally in Charlottesville crashed and killed two Virginia state troopers later in the afternoon, Virginia police said. The FAA is investigating the helicopter crash, and the National Transportation Safety Board will determine probable cause, NBC News reported. The pilot, Lieutenant H. Jay Cullen, 48, of Midlothian, Virginia, and Trooper-Pilot Berke M.M. Bates of Quinton, Virginia, died at the scene. President Donald Trump, speaking Saturday afternoon from New Jersey where he has been on a working vacation, condemned the violence in Charlottesville, calling it an "egregious display of hatred, bigotry and violence on many sides." "The hate and division must stop now," he said. He did not respond to questions about whether he would denounce support from white nationalists. A unnamed White House official clarified to NBC News about what the president meant by "violence on many sides," saying that Trump was "condemning hatred, bigotry and violence from all sources and all sides. There was violence between protesters and counter protesters today." The attorney general of Virginia fired back at Trump's comment, saying, "the violence, chaos, and apparent loss of life in Charlottesville is not the fault of 'many sides.' It is racists and white supremacists." Before the car crash, Trump condemned the earlier clashes on Twitter, writing, "We ALL must be united & condemn all that hate stands for. There is no place for this kind of violence in America. Lets come together as one!" The president and his representatives have not yet acknowledged the death in the incident. Sen. Mark Warner of Virginia released a statement saying: "We condemn the intolerance behind it and those who would pass it off as a legitimate political movement." First lady Melania Trump and House Speaker Paul Ryan also took to social media to denounce the clashes between protesters and counter-protesters. Small bands of protesters who showed up to express their opposition to the rally were seen marching around the city peacefully by midafternoon, chanting and waving flags. Helicopters circled overhead. Right-wing blogger Jason Kessler had called for what he termed a "pro-white" rally to protest the city of Charlottesville's decision to remove the confederate statue from a downtown park. 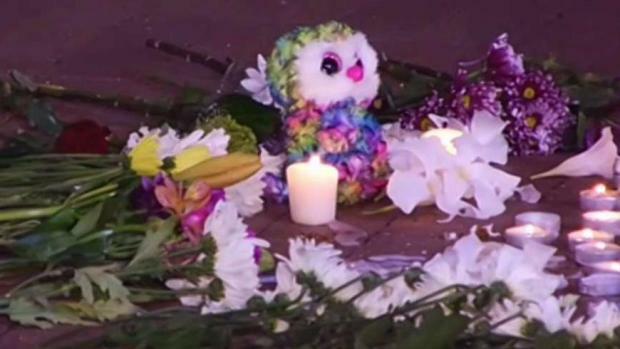 A makeshift memorial was assembled near the place where a car plowed into a crowd of people, killing one woman. News4's Derrick Ward spoke with a Charlottesville resident who says she worries about how the violence and hatred will affect her children. It was the latest confrontation in Charlottesville since the city about 100 miles outside of Washington, D.C., voted earlier this year to remove a statue of Lee. Between rally attendees and counter-protesters, authorities were expecting as many as 6,000 people, Charlottesville police said this week. Among those expected to attend were Confederate heritage groups, KKK members, militia groups and "alt-right" activists, who generally espouse a mix of racism, white nationalism and populism. Both the Anti-Defamation League and the Southern Poverty Law Center, which track extremist groups, said the event had the potential to be the largest of its kind in at least a decade. Officials had been preparing for the rally for months. Police instituted road closures around downtown, and many businesses in the popular open-air shopping mall opted to close for the day. Charlottesville Mayor Michael Signer said he was disgusted that the white nationalists had come to his town and blamed President Donald Trump for inflaming racial prejudices with his campaign last year. 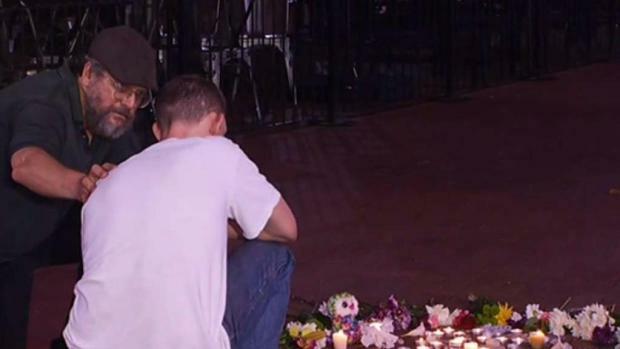 "I am heartbroken that a life has been lost here," he wrote on Twitter later Saturday on Twitter. "I urge all people of good will - go home." For now, the Lee statue remains. A group called the Monument Fund filed a lawsuit arguing that removing the statue would violate a state law governing war memorials. A judge has agreed to a temporary injunction that blocks the city from removing the statue for six months.